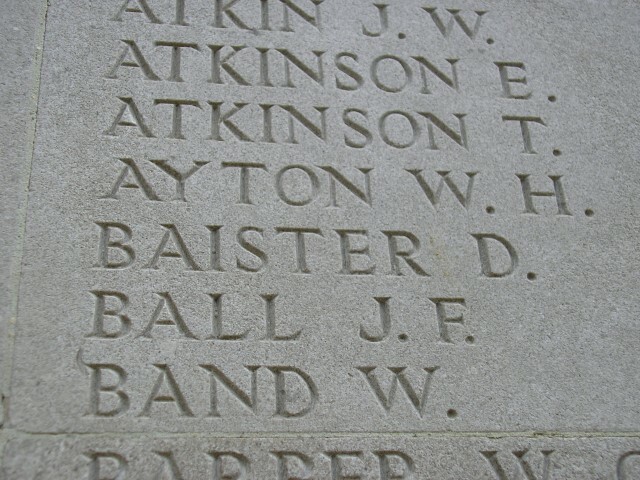 36723, Private David Baister, 1/5th battalion, the Durham Light Infantry was killed in action 27 May 1918 and is commemorated on the Soissons Memorial, France. He was 31 years old and is commemorated on the Evenwood and Etherley War Memorials, the Rolls of Honour in St. Paul’s Church, Evenwood, St. Cuthbert’s Church, Etherley and Evenwood Workingmen’s Club. The 1891 census confirms that David’s father Robert was born at Eston, Yorkshire and his wife was Isabella was born at Ingleton, Durham. Robert and his sons John, Robert and Thomas were all coal miners. By 1901, Isabella was a widower. David’s brothers John, Thomas, William and Richard all worked as coal miners. 14 year old David was not working and presumably at school. By 1911, David’s mother Isabelle was 63 years old and his brothers John (aged 44), Thomas (aged 38) and Richard (aged 27) were all single and lived at home. All were coal miners (hewers). David aged 24 was a mason and also lived at home. Isabelle Tallentire, a 19 year old single woman lived there as a domestic servant. 22 April 1916: David Baister married Florence Margaret Banks at Evenwood. A son John David was born in February 1917. By 1918 the family lived at 13 Copeland Row, Evenwood. 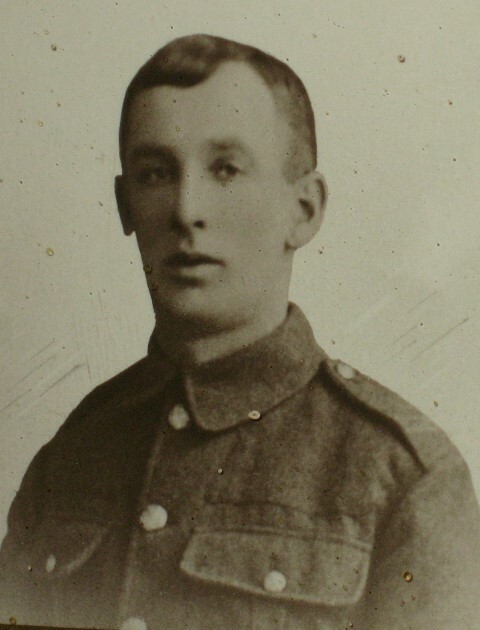 David Baister was killed in action 27 May 1918 leaving a wife Florrie and an infant son, known as “Jack.” Within the period of about 2 years Florrie was a bride, a mother and a widow. Florrie died in May 1920  leaving her mother Mrs. Banks to look after Jack. Private D. Baister landed in France 1 April 1917. The service records do not indicate the MGC company he joined. 10 May 1917 Private D. Baister was found guilty of the offence of “When on active service dirty rifle when mounting guard” and was sentenced to 2 extra guard duties. He was admitted to hospital for a 3 week period during May/June 1917 suffering from “Pyrexia” (fever). The following account will deal with the 1/5 Bn., DLI during 1918. After suffering particularly heavy casualties while on the Aisne, the Division was substantially re-organised. 5 May: 5/DLI marched to Glennes, a village 2 miles south of the Aisne canal. The section of the line allotted to the British Divisions included Craonne at the eastern extremity of the Chemin des Dames range of hills across towards Rheims. The 50th Division held the sector from Craonne to La Ville-aux-Bois. On the left were French troops and on the right was the 8th Division. Further to the right was the 21st Division. The 25th Division was held in reserve. The 50th Division was organised on a 3 brigade front, each brigade having 2 battalions in the line and 1 in reserve. The 150th Brigade was on the left, the 151st in the centre and the 149th on the right. The 50th Division al HQ was at Beaurieux. It was peaceful for the first 3 weeks. 6 – 13 May: 5/DLI in the front line facing the village of Corbeny, just within the German held territory. 25 May: went to the reserve trenches at Chaudres and Cuiry-les-Chaudres, 2 villages on the north bank of the River Aisne. 26 May: 7.20 pm orders were received to proceed in fighting order to Centre d’Evreux, the reserve position. Intelligence indicated that a massive enemy attack would be launched at 1.00am. “B” “C” & “D” Companies were put into a huge dug-out near Brigade HQ and “A” Company in another 100 yards away. Gas curtains of the dug-outs retreated with chemicals. Ammunition wagons hastened to load the batteries with shells. 9.00pm. British artillery opened up to harass roads and villages behind the lines. 12.00 all likely assembly places were kept under heavy fire. The bombardment continued for three hours, gas shells & HE poured into the British and French lines. The front line trenches and wire entanglements were swept away. Dug-outs were broken in, gas filtered into and over the area, communication between areas was impossible, runners may have found their destinations but never returned. The French and British batteries kept their guns in action until they were knocked out or overcome by gas. 4.00 am: the German infantry advanced, the attack made rapid progress. Early afternoon: further south, the 21st Division was hard pressed and there was fighting at Cormicy and Cauroy. On the left, the French were forced back as the Germans broke through and captured Beaurieux in the morning and bridges at Maizy. What of the 50th Division? 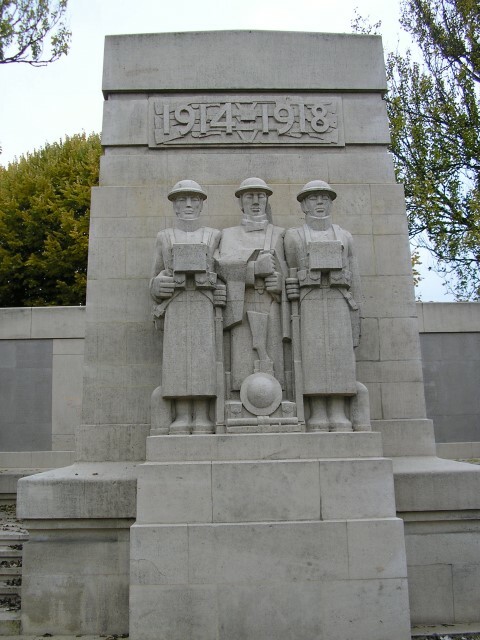 They were on the left of the British front and casualties had been heavy, survivors were bewildered with the shelling, sick with gas and half blinded with their respirators. The 150th Brigade was practically annihilated. 7.00 am: the Germans were close to the 151st Brigade HQ, 5/DLI was in reserve in the dug-outs. They were ordered to proceed to the reserve trenches but this instruction came too late and the enemy were already in these trenches. With no time to get into proper battle formation, confusion was great and it was obvious that a disaster had occurred. Officers tried to get the men clear of the surrounding woods and back to the Aisne bridges in order to hold up the enemy. Casualties were heavy – 9 officers were killed and 5 wounded, others were captured, many ranks were leaderless and failed to reach the bridges. Chaudardes was heavily shelled. Men of all battalion collected at the higher ground at Concevreux and were re-organised into one weak brigade. Their position was heavily shelled and by 5.00pm. the German infantry advanced to high ground above Muscourt. The pressure continued – Ventelay and Bouvancourt both fell, the enemy entered Courlandon. The remnants of the Division fell back to Montigny. 29 May: Towards the evening, the remnants of the 50th Division were withdrawn. They marched to Igny where they arrived at 2.00am 30 May. After 12 hour rest they marched to Vet la Gavelle arriving 31 May. Then news came that the 50th Division was to be broken up and early in June the remnants entrained at Sezanne for the Abberville area. They took billets at Caumont where orders were received that the battalions were to be reduced to the strength of Training Cadres (10 officers and 50 other ranks). Training Cadres of the 5th, 6th and 8th DLI moved to Dieppe then about the middle of August moved onto Rouen where they built a new camp for instructing reinforcements. 27th 1am – Terrific enemy barrage consisting of every calibre of shells and trench mortars accompanied by gas and tear shells. 6.30am – C & D Coys were ordered to proceed to the Intermediate Line. 7.am – A & B Coys were ordered to reinforce this position. The enemy attack had commenced at 4.0am but owing to the heavy barrage all communications were cut and no information had come back from the front line. 28th – On reaching the Intermediate Line it was found that the enemy were already round right and left flanks. The Battn had suffered extremely heavy and only a portion of B Coy was to be found. This detachment withdrew and held a position at a clearing N.W. of PONTEVERT and held up the enemy in their front for a considerable time. Ammunition was very short. The enemy were again found to be round both flanks of the detachment. A withdrawal was made to a line S. of PONTEVERT which was in continuation of a line held by a portion of the 25th Divn. The enemy by this time had crossed the AISNE higher up and it was therefore plain the position then held was likely to be turned. It was decided to withdraw to CHAUDARDES but a reconnaissance ascertained that the enemy were between this place and CHAUDARDES which rendered this withdrawal impossible. Nearly all this detachment were cut off a few escaping over the AISNE before the bridge was blown. This was the last organized body of the battn. Odd portions and men sent up from the Transport Line continued fighting with the 25th Divn until the 50th Divn was withdrawn on the 29th. Casualties during this battle amounted to 33 officers and 650 ORs but owing to the wooded country, large extent of ??? and no survivors from the Btn no accurate details of these casualties are available.